This overhead view of the Kash Boodjeh-designed restroom model indicates its orientation with the sidewalk and building. CITY HALL – There may be nothing new under the sun, but there is something new behind the crescent moon that emblazons an outhouse door. City Councilmembers Susan Ornelas and Shane Brinton have been meeting with concerned citizens group focused on finally bringing about a public restroom in downtown Arcata. 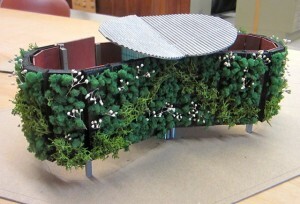 Their suggestions have been incorporated into a design by renowned Arcata architect Kash Boodjeh, which has advanced to the model stage. The restroom’s design is still tentative, but it doesn’t look anything like the cinder-block affair that Public Works designed last time a public restroom was under serious discussion, nor the glitzy, super-expensive high-tech jobs used in some metropolitan areas. 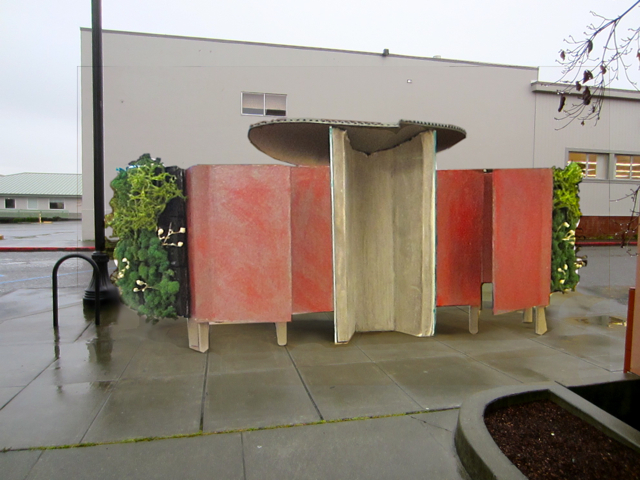 So far, the Arcata version features two stalls – one for men, one for women – with a hand-washing station at the entrance. Inside, it is lined with modular, replaceable panels designed in conjunction with artists of the Ironside Gallery. The outside features a living “green wall” of living plants, which is presumed to be somewhat vandalism resistant. That component alone costs $18,000. An open design, with only a partial roof, is intended to deter attempts at habitation. The structure is site-specific to the location near the Veteran’s Memorial Park on Eighth Street between F and G streets, Boodjeh said. The new restroom is also designed to be relatively easily removable, should it prove non-sustainable for some reason. Design and construction costs are unknown, but could be as much as $100,000, according to a City staff report. The report estimates annual maintenance costs at $12,000 to $20,000. Funding sources would have to be identified, though the matter could be further advanced during upcoming goal setting and budget meetings with the City Council. A rough approximation of the view from the alley, showing the restroom's entrances. This entry was posted on Sunday, April 8th, 2012 at 8:58 am	and is filed under News, Environment, Technology. You can follow any responses to this entry through the RSS 2.0 feed.